The bacon and BULL'S-EYE Barbecue Sauce make these burgers especially juicy and delicious! Mix meat, bacon and 1/4 cup barbecue sauce just until blended; shape into 4 (1/2-inch-thick) patties. Grill 7 min. on each side or until done (160ºF), brushing with remaining barbecue sauce for the last 5 min. Top with Kraft Singles; grill 1 min. or until melted. Fill buns with cheeseburgers, onions, tomatoes and lettuce. Prepare using Cracker Barrel Medium Cheddar Cheese Slices. Serve on toasted hamburger buns. 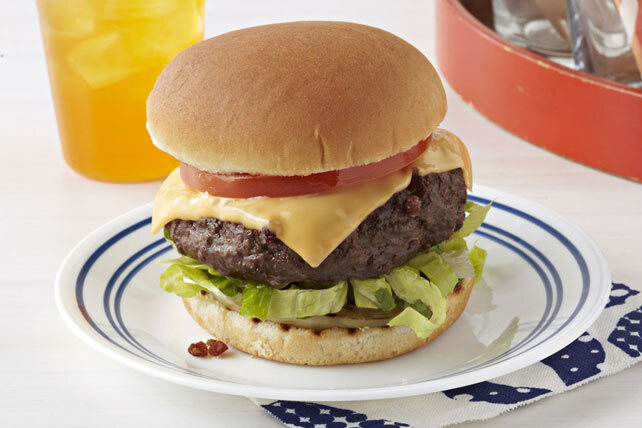 Add buns, cut sides down, to barbecue when topping burgers with Singles; grill 1 to 2 min. or until toasted.